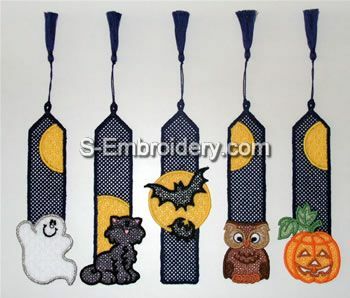 A set of 5 cute freestanding lace Halloween bookmarks. A freestanding lace Halloween bookmark with a ghost. A freestanding lace Halloween bookmark with a cat. A freestanding lace Halloween bookmark with an owl. A freestanding lace Halloween bookmark with a pumpkin. A freestanding lace Halloween bookmark with a bat.